In July the Trustees of the Social Security Trust Funds issued their annual report, detailing the continued deterioration of the program’s finances. Despite a gloomy outlook, the media largely ignored the results. The Social Security Administration summarized the report by saying, “By most measures, there is little change from the 2016 report in the outlook for the combined OASDI Trust Funds, with annual balances slightly better in the short term and slightly worse in the long term.” The media largely echoed that synopsis. What measures are you looking at? Virtually every metric that I watch deteriorated by more than 5 percent in a year over year comparison, so I have to ask what results would have inspired concern over the changes in the forecast. The increase in the unfunded obligations surpassed the entire revenue pool collected by the program over 2016. Someone turning 69 today expects to outlive the system’s ability to pay scheduled benefits. That cushion fell by a year to 17 years, or more than 5 percent. That isn’t a lot considering that workers at normal retirement age expect to live 20 years. More than 80 percent of voting aged Americans expect to be alive in 2034. It is possible that the public is generally weary of the idea that Social Security is going to into crisis. It has been on a downward trajectory for nearly 3 decades, accompanied by a polarizing debate that is generally combative and unproductive. In any case, the response to overwhelming statistical evidence of the direction of the program is: even if Congress does nothing, you will still get 77% of your benefits. To state the painfully obvious, it wouldn’t be a crisis if things go according to plan. Crisis is a byproduct of panic. The financial crisis of 2008 was less about sub-prime mortgages and more about a broad-based complacency to risk that proved to be real. The risk of default was always there; we were just oblivious to it. Once the risk was revealed, people panicked, sending even performing loans to the range of $0.22 on the dollar. The loan quality didn’t change. Our fear of it changed. No one plans for fear. At this point the plan seems to be: allow the system to run short of funds until it runs short of money at which point we will have reductions in benefits. For millions of seniors, a crisis in Social Security will operate much like a tsunami that specifically targets those that can’t swim. This program isn’t like other government benefits where reductions will be met with adjustments. If we cut farm subsidies for wheat, farmers will switch to corn. The elderly and disabled do not adjust nearly as well to economic change. I will spare the data because it understates the situation. Our view of the future of the program is drawn from snapshots today as though the system tomorrow will be the same as it is today. That is not true of dependence, which rises with age, nearly doubling between the age of 70 and 80. The snapshot that we consider today reflects the bulge of Baby Boomers at an age where dependence upon Social Security is generally less. There are a lot of reasons that the guy who is 95 is more dependent upon Social Security than the worker who is 65. Younger retirees may have more job opportunities. 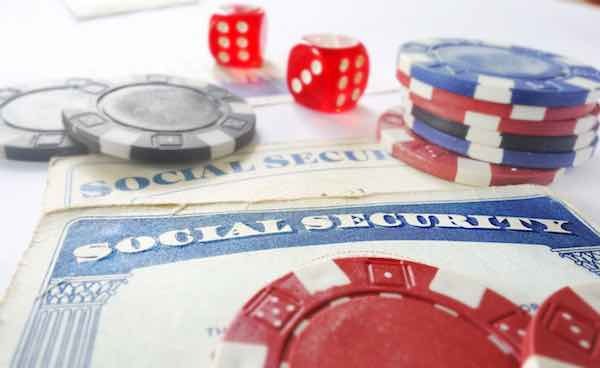 Over the course of retirement, seniors tend to use up savings to augment Social Security. Another example is that many pensions are not adjusted for inflation. A static pension over the last 30 years has lost more than half of its buying power. So we are fairly certain that dependence will rise substantially over the next 17 years. We don’t know. The source of the data stops tracking dependence by age at 80. Between the ages of 70 and 80, the percentage of people who collect 90% of their income from Social Security rises to 48 percent. As bad as that sounds, it is much worse. The experts at the Social Security Administration believe that about half of the people turning 69 today will be turning 86 in 2034 when benefits are reduced. So the plan is to reduce benefits by 23% at a time when dependence is rising. In reality, we do not really know the timing, or the size of the crisis. We do not even know how these reductions would be allocated to the individual. The really horrifying part of the plan is that there is no plan.